Several species of elms (Ulmus ); the American elm, in particular. 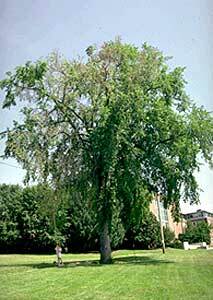 Both of these species are important solely for their ability to inadvertently vector (transmit) Dutch elm disease to healthy, susceptible elms. The smaller European elm bark beetle is far more aggressive, and therefore more successful, at colonizing weakened elms. 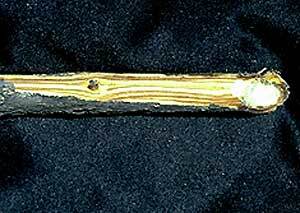 They often virtually exclude the native elm bark beetle from any particular tree. However, the native elm bark beetle is more successful in the northern areas of New York, New England and in Canada where the low winter temperatures limit the success of the other species (USDA). The adults of these species emerge from under the bark of unhealthy elms in the early spring and seek the tender bark on healthy trees where small twigs form crotches. 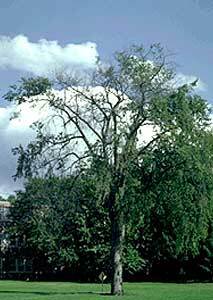 If the elm from which they emerged was infected with Dutch elm disease (DED), then their bodies will be covered with those fungal spores. By feeding on the tender bark of healthy tree twigs in the spring, and creating wounds, they then inoculate that tree with DED from the spores on their bodies. Adult emergence occurs over several weeks in the spring. Unhealthy trees are then sought by the females for egg laying. The female will chew through the bark and form a tunnel at the interface of the inner bark and the outer wood. This tunnel may be 2-3 inches long and eggs will be laid along its path. The female will then emerge at the other end. 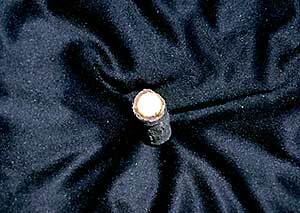 The larvae will hatch soon thereafter and feed by making galleries perpendicular to the female's gallery. 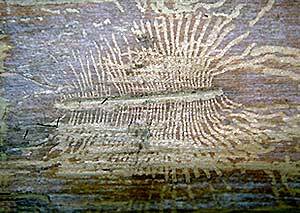 The adult egg-laying gallery of the smaller European elm bark beetle runs parallel to the grain of the wood while that of the native elm bark beetle goes across the grain. Over-wintering usually occurs within the host as either a larva or a pupa. In Canada, there is only one generation per year, but in more southern regions there may be two generations per year. Soon after an elm becomes infected with Dutch elm disease the foliage in that area will quickly yellow and droop, creating what is known as a "yellow flag". This usually occurs on the upper perimeter of the tree's canopy beginning in late May through much of June; it may also occur later in the season. Depending on the number of feeding sites or "hits" that the tree experiences from the bark beetles, there may be several flags appearing, which indicates multiple infection sites. These flags usually affect the terminal two feet of the branch tips and are a result of the DED fungus growing in the vascular system and slowly spreading down the branch toward the main trunk. Therefore, it is essential to monitor for yellow flags and immediately have them removed from the tree and sent to a diagnostic lab for verification of DED. If DED is found to be the cause of the flagging, then as much of that branch as possible should be quickly pruned from the tree; perhaps as much as 15 or 20 feet. This is the only way to stop the spread of DED from reaching the main trunk and becoming completely systemic in the tree and killing it. All pruned out wood, and trees that are cut down, due to DED, cannot just be left lying around, even as cut and split firewood; it will act as a breeding site for the beetles and a reservoir for the disease. Therefore, it immediately needs to be de-barked or destroyed. Any trees that are lost to DED must be removed as soon as possible. Elm bark beetles require a tree in a very weakened state or one that is freshly dead in order to be successful in colonization; elms dying from DED are perfect breeding sites for these beetles. Once a tree has been dead for a year or more it is usually too dry for elm bark beetle attack but usually they are colonized long before this occurs. 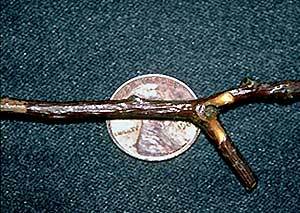 Elm trees that were infected in the previous growing season and not pruned will die in the second season and the disease will exist throughout its vascular system, including in the roots. DED can be spread from one tree to another via root grafts. Infected trees, from the previous season, that are next to a healthy elm pose a great threat to that tree. Therefore, root trenching should be performed between the two trees to reduce this risk. Certain fungicides are available, as a preventative measure, not curative, and have shown good results in helping a healthy tree resist the invasion of this disease. 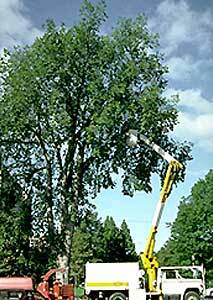 Overall, careful monitoring and sound sanitation practices are essential for preventing Dutch elm disease.